Some simple elegance is all you need to make your dining room space feel more like home. The Gia Brown Dining Table with Four Chairs has a rich brown finish with sophisticated styling to complete even the smallest of spaces. This dining set encompasses a thoughtful design that allows you to place it in a dining room, eat-in kitchen or a family game room. Perfectly versatile and perfectly chic, this set featuring Mindi and rubberwood solids and veneers will endure through many seasons of use. Claim this classy little set as your own today! 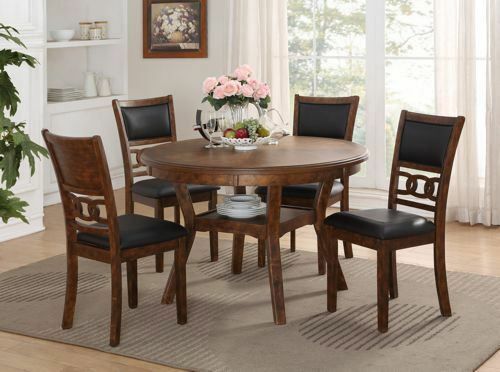 Some simple elegance is all you need to make your dining room space feel more like home. The Gia Brown Dining Table with Four Chairs has a rich brown finish with sophisticated styling to complete even the smallest of spaces.